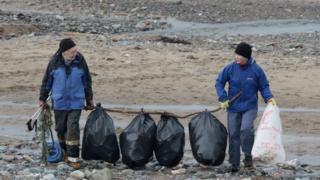 The work of a Manx beach cleaning charity will be taken to the world stage after it earned praise from a UNESCO director. Dr Han Qunli said the work of the Isle of Man Beach Buddies group was of the very highest standard. The charity, which is celebrating its 10th anniversary, has worked with nearly 10,000 volunteers to collect thousands of tonnes of debris. Founder Bill Dale has now been invited to speak at universities worldwide. He said the UNESCO recognition had "changed everything". "Suddenly we are no longer considered to be an isolated little operation on the Isle of Man," he added. "The idea that local communities can take responsibility for the welfare of the marine environment is inspiring people all over the world." Mr Dale, who has received the British Empire Medal for services to the marine environment, has been invited to lecture at universities in Ohio, California, New York, Washington DC, New Zealand, Australia and Hawaii. "I want to tell the world a story about the thousands of people on the Isle of Man who care deeply about the environment," he continued. "It all started while I was walking on a beach with my dogs. All I could see for miles and miles was a load of plastic rubbish. "I picked up a bag, filled it up and did it again. Then I put out an appeal on social media to see if I could get some help." Ten years later Beach Buddies has engaged with almost 10,000 volunteers - or about an eighth of the island's population. The group, which runs weekly cleaning sessions, aims to make the Manx coastline the "cleanest in Europe". The Manx Basking Shark Watch group said the "heroic" work of the charity was also helping to keep the sea safe. Coordinator Jackie Hall added: "After basking sharks were seen with plastic hoops digging deep into their noses, Beach Buddies did an amazing job of rallying the public into action". The Isle of Man government said the beach cleans were also keeping tourist numbers up by "protecting the island's most valuable asset". A spokesman added: "Research has consistently shown that visitors value the Isle of Man's beautiful natural environment, including its miles of dramatic coastline. "The work of Beach Buddies is a great example of people and nature working together in harmony".